When analysing your Google AdWords campaign performance, have you ever wondered what would happen if you doubled or tripled your daily budget? And would an increase in budget equate to more ad impressions, more potential clicks and more conversions? Or have you ever wondered whether your campaign performance was losing you ad impressions; and if so how to calculate how many impressions you were indeed losing? The answer to this conundrum is in Google AdWords impression share metrics illustrated below. 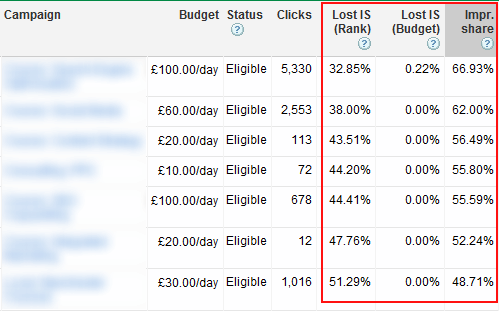 The 3 columns highlighted in red are the secret to understanding how to claim your lost AdWords impressions. The percentage of impressions that wasn’t received by your ad due to low ad rank. You can improve your ad rank by increasing your bid for keywords in your campaign or by improving your ad quality. So clearly we are looking for as low a score as possible, indicating that our campaign performance is running optimally. A score of 50-85%+ indicates that much improvement can be made to the campaign in order to increase the number of possible ad impressions. The percentage of impressions that wasn’t received by your ad in the Search Network due to insufficient budget. Consider increasing your budget to capture this missed potential. If your Lost IS (budget) is running at 0% then you have maxed out your budget and exhausted possibilities of receiving more impressions by increasing your budget. 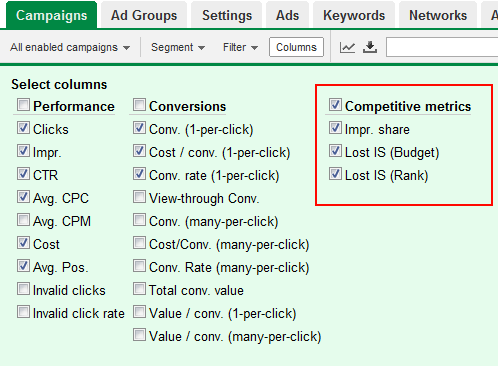 For those with deep pockets, a 0% Lost IS (budget) can be a frustrating situation as it requires you to look at other avenues for improving your AdWords campaign performance other than budget. A much higher Lost IS (budget) on the other hand, would imply that you have more opportunities for impressions if you were to increase your budget. Ironically, this can be an advantageous position to be in! The percentage of impressions where your ads were shown out of the total available impressions in the market that you were targeting. Clearly, what we want is as high a % as possible, indicating that we are making use of as many potential impressions as are available for our keyword bids. How do I get this data? When you look at your campaign metrics these columns aren’t always visible. To add them to your campaign data, click on the “Columns” button and select the “Competitive metrics” as highlighted below. If anyone has Lost IS (rank): 0%, Lost IS (budget): 0% and Impression Share: 100%, we’d love to hear from you!